Hari Nef attended the European premiere of ‘Assassination Nation’ during the 62nd BFI London Film Festival on Friday (October 19). Her Simone Rocha Fall 2018 coat perfectly captures the romantic essence of the British designer. 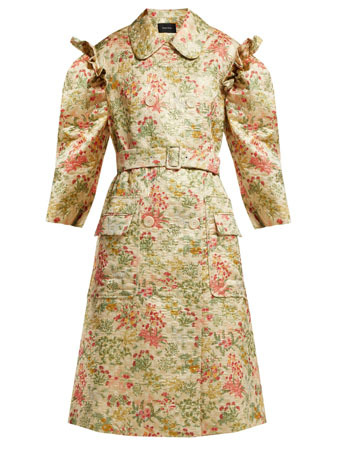 This brocade style with an antique floral print is quite the statement piece. We have seen different versions on Amandla Stenberg, Alice Eve and Gayle Rankin recently. Keeping the romantic vibes flowing, the actress completed her look with pink furry sandals.